Have you imagined yourself fly fishing one of the top rivers in north Georgia? There are many highly skilled anglers and other important local sources that say the Toccoa River near Helen Georgia is one of the best places to catch trophy brown trout in the State of Georgia. It is important to know where the most productive locations are in order to find these aggressive fish. In this article, we'll help distinguish the different areas of the river as well as provide critical information about how to be successful fishing this hot spot. There are two main sections of the Toccoa river. A fisherman must know the contrasts between them as it will determine the type of success they'll have. The center point for discovering the separate sections of the river is Lake Blue Ridge. Above Lake Blue Ridge is the delayed harvest section where anglers are allowed to keep fish after November 1st and May 14th. The remainder of the year is catch-and-release. The regulations create an opportunity for more abundance fishing experiences year after year. Not only do the fish have a better chance to grow and develop, but the program brings more conservation, protection, and regeneration for the species. The best time to fish this section is in the Fall after there's been some rain, but not too much as the river becomes off color and challenging to fish. If it is big brown trout you're after and long stretches to drift fish, the tail water section of the Toccoa River is an excellent place to wet your line. This river is more challenging in terms of access, but if you have a watercraft, this is the place for you. Below the dam of lake Blue Ridge the Toccoa river continues and it flows out from the cold deep water in the lake. This is where it gets the name of tail water. The consistent cold water promotes a year round fishery and a healthy aquatic life. It also maintains the right temperatures for trout to reproduce and thrive in. A few other key aspects to know for this section of the river is that the first fifteen miles down from the release point is private land on either side of the river. This is why the access for wading fishermen is so difficult. On a positive note the landowners invest in the fishery by utilizing feeders that send a constant flow of pellets to the hungry trout. This gives them a food source in addition to the natural aquatic insects. On the Toccoa River, there are only a few main sections that are wadable for fisherman that are looking to be up close in personal to the fish rather than taking a float trip. The first wadable location is just below the Blue Ridge Lake Dam a Tammen Park. There is about a mile stretch at Curtis Switch that allows anglers to wade North or South to find hungry fish as an additional option. There are plenty of shoals in this area, but it is key to know when the water will rise. There are more stocked fish in this river location. The next closest access point is almost into Tennessee. This Georgia location is Horseshoe Bend Park in McCaysville, Georgia and it is pretty much the last fishable section of the river due to environmental hazards. It is essential to know the water flow levels in either location. For the upper section the flow and water clarity will be determined by how much rain has fallen. For the lower section, it depends on the water release schedule at the dam, and environmental hazards. The predicted release schedules are published online and are available by phone, but TVA is serious when they say that the river can rise unexpectedly and there is no siren to warn fishermen. For Release Information, Call TVA, 1-800-238-2264, then dial 4, 23, # to reach the BlueRidge Dam Information or visit www.tva.com. These rising waters can actually be very positive for fishermen as well. When the extra release of cold water comes into the river the trout actually become more active. This is especially true during the summer. In regard to fly fishing the upper section of the Toccoa River, Near Helen Georgia, the best patterns of flies to fish with are attractor patterns like royal stimulators or royal wulfs. These imitate a wide variety of insects that may be coming off during the year. In this section of freestone river the hatches are not as consistent and more difficult to determine. The predictability of this tail water river gives an angler the ability to read the water as well as the time of the year to pinpoint what the trout will most likely be feeding on. Having the combination of large trout and a prolific food source provides an excellent environment for a successful day of fly fishing. The history of this fine fishery can be traced back to the Native Americans. There is evidence of fish traps, and wedges of stacked stone that covers the width of the river. These natives were quite inventive. 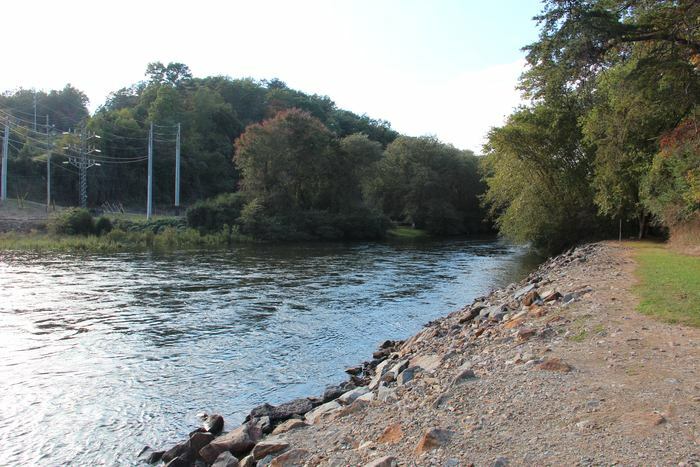 There are also multiple locations where these fish weirs are placed in some of the best fishing locations on the River between the Lake Blue Ridge dam and McCaysville on the Tennessee border. These fish traps have survived years of rushing water. Trout were not likely the forage at his time because the river was most likely a warm-water fishery before the construction of Lake Blue Ridge. These fish traps although outdated create an awesome platform to wade out on and cast a fly to rising trout in the evenings. What a magical sight to see these beautiful trout rising and think about the Native Americans of old that used to walk these same banks in search of fish. There is a great deal of history on the Toccoa River and it has not been left behind. Many times the hatches of midges become so dense that they could be called a swarm. These insects congregate together in the evenings to breed and lay their eggs. It is a great time for fly-fishermen to take advantage of the trout that wait below for one of these tasty insects to light on the water. There are millions in the air and as soon as they are ready to lay there eggs, the female will spread her wings out flat on top of the water and drop her eggs. This would be called a spinner fly and the fly imitation pattern is tied for this exact same scenario. The trout will key in on this stage in the insects life. So, you know that when the insects are congregating in these breeding balls in the air, the trout are most likely feeding on the spinners. The difficulty lies in the size of the flies. They are normally a size 22 hook. And this is just larger than the very front tip of your pinky finger. You can imagine how difficult it is to thread the hook with fishing line, much less see it on top of the water. This is why most fly-fishermen will use the spinner fly as a dropper fly and a slightly larger dry fly attached above so that they have a location to look in while the flies drift along the water. 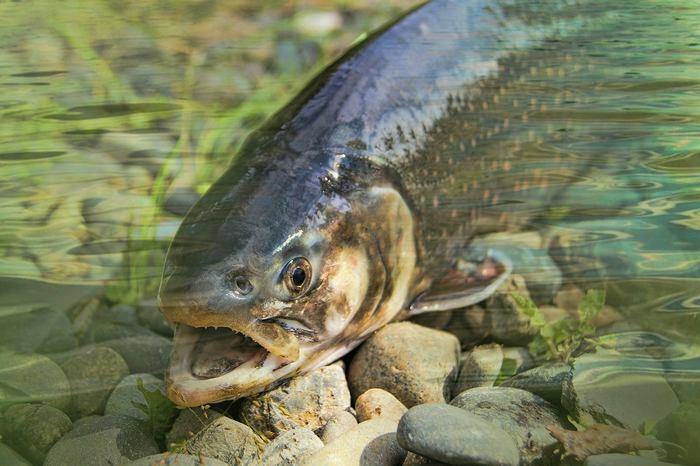 Trout usually sip the fly right off of the top of the water so it can be very difficult to see their strike. It is different from when they jump all the way out of the water like they do when chasing down an emerging caddis. This stage is such a violent strike because the insect is taking off for flight instead of resting on the water to expire. And it can be identified very easily because the trout will be jumping all around you. Many times when they take your emerger fly in this scenario they will hook themselves because of their momentum. On the other hand when fishing with the tiny midges either you have another attractor pattern tied to the midge or you must look very carefully for the trout to rise. Then you put low light conditions into place and it is even more difficult to see the rise. Most of the time when I am in this situation I will make shorter casts and the keep a close eye on the end of my fly line so that I can see the general area that the trout will rise. It is important to have a headlamp with you in these scenarios not only for tying on flies in low light conditions, but also to find your way out of the river and back safely to your vehicle. 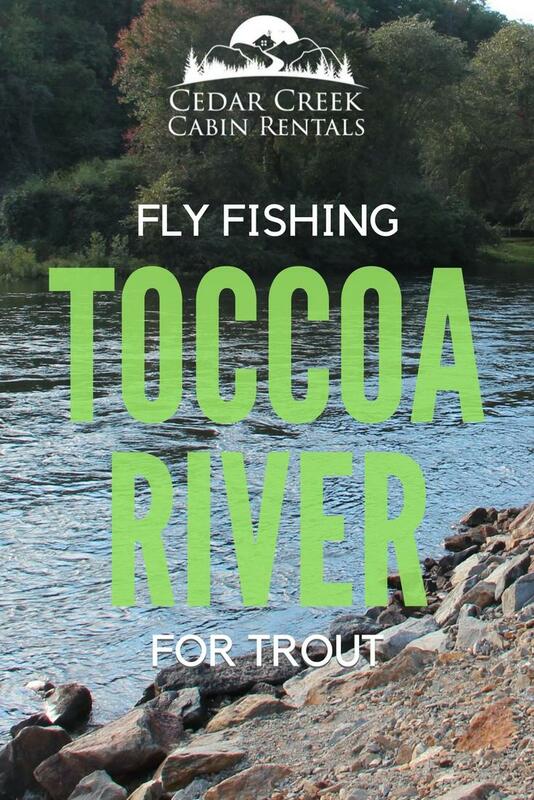 Are you ready to take on the Toccoa River trout? With the Toccoa river just an hour drive from Helen Georgia, it makes a great spot to go fishing for your North Georgia trip. 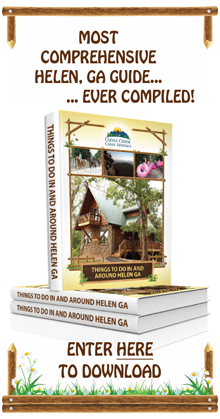 Our cabins are located in and around Helen Georgia and we'd love to have you stay with us for your next fishing adventure. 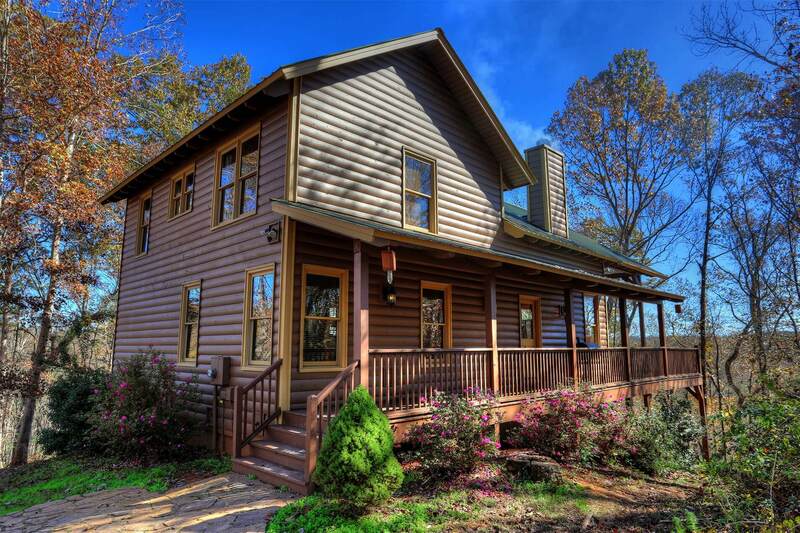 Click here to view our cabin rentals. Whether you need tackle, gear, flies, a fishing license, or a fishing guide these great local companies can serve your fishing needs. We've got a series of articles that make up our fishing article hub. Here you'll find blogs, links, images, and videos that help you have the best fishing experience in North Georgia. Here is a list of these resources.